I wrote a piece on Myles Garrett for the Washington Post this week, breaking down what my Big Board would look like if I assessed every college football player instead of just draft-eligible players. In so doing, I went back to look at the recruiting rankings of the true sophomore and true freshman classes to make sure I didn’t forget anyone. The sophomore class is filled with next-level studs — Garrett, Nick Chubb (Georgia), Leonard Fournette (LSU), Samaje Perine (Oklahoma), Adoree Jackson (USC) and Clemson QB Deshaun Watson. That class is loaded, no question. But, I wanted to stay true to the task at hand. So, I pulled up the true freshman listing — the class of 2015 — to make sure I hadn’t erroneously omitted someone. Honestly, I knew that it would be tough to put any true freshman on the list given the fact that they had played, at most, four college games. So, I rifled through the list and saw recognizable names, but no one that really gave me pause. Then, on ESPN’s Top 300, I got to number 35. No true freshman football player in the country has shined brighter. No true freshman football player has put in the work that he has. No true freshman has made a bigger impact for his team, minus one, perhaps: Josh Rosen at UCLA (only because he’s a quarterback). 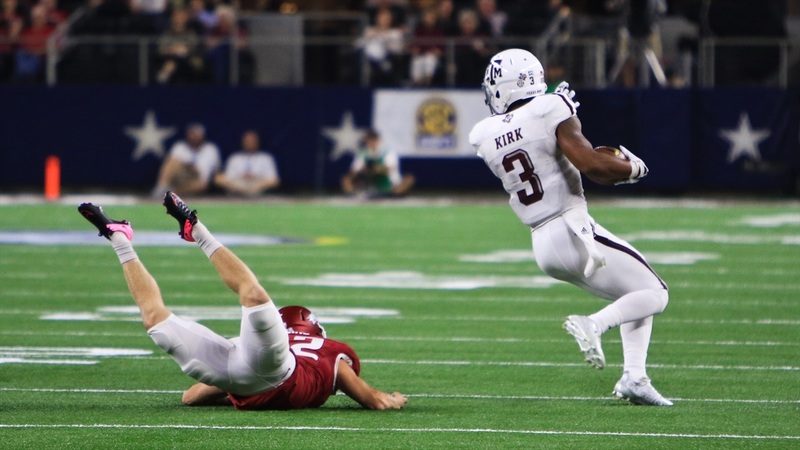 The Aggies had two players in the top 13 and three in the top 35 and all have made contributions to this year’s squad, but Kirk has truly been the offensive weapon stirring the drink this season. Whether it’s on special teams, in the passing game or even the running game (disguised as a pass) Kirk has turned games in A&M’s favor. Whenever he’s on the field, teams must take notice ... and it was clear vs. Arkansas that the Hogs were aware of his presence, but unable to completely slow him down. 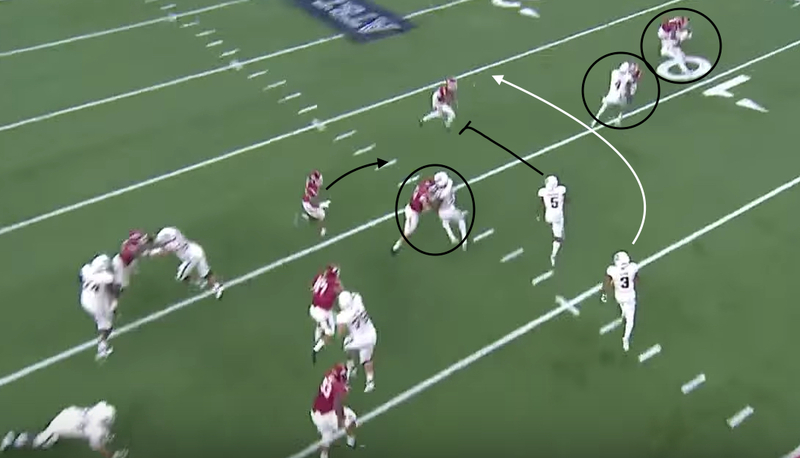 Here’s a great example of how A&M offensive coordinator Jake Spavital used him against the Razorbacks to get loose from deep in Aggie territory. The Aggies were in 10 personnel with one running back, no tight end and four receivers on the field. Kirk aligned to the left of the formation, off the ball (and that’s one key on this play). 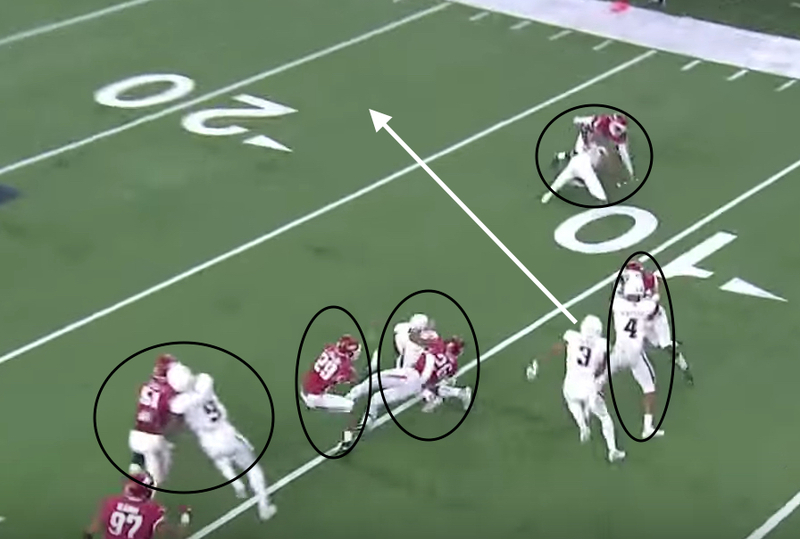 Here’s one other key to eye on this play that I actually missed the first time I studied the play: RT Germain Ifedi moved to the left side in between LG Jeremiah Stuckey and LT Avery Gennesy, which left RG Joseph Cheek as the only OL to the right of center Mike Matthews. With the ball on the left hash, RB Tra Carson set to the right hand side and a heavy alignment to the left. The Hogs' front was forced to align into the boundary, which left only TWO front seven players to the field. One was OLB No. 51 Brooks Ellis, and we’ll get to him in a second. The other was a hand-in-the-ground DE that was irrelevant because of the overall play design. 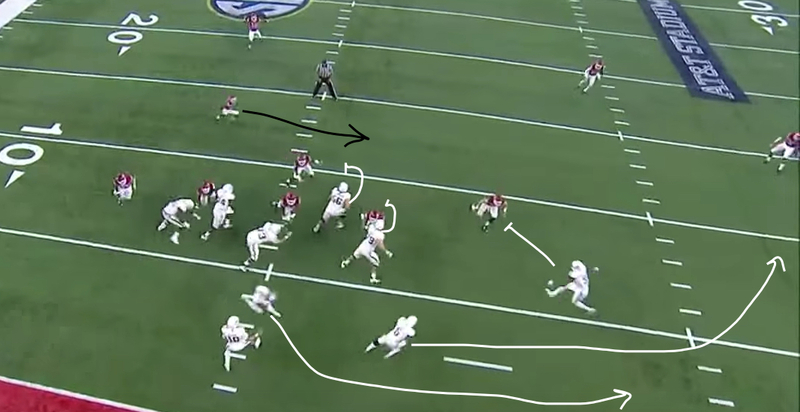 Put it this way: if Christian Kirk had gotten tackled by THAT DE on this play, Kirk was either injured or that DE was Superman. Neither was true. Thankfully. With Kirk off the ball, the Hogs had to expect motion of some kind — HAD TO — and it appeared, at first glance, that the defense was aware. But, the play design against that defense still got Kirk free. 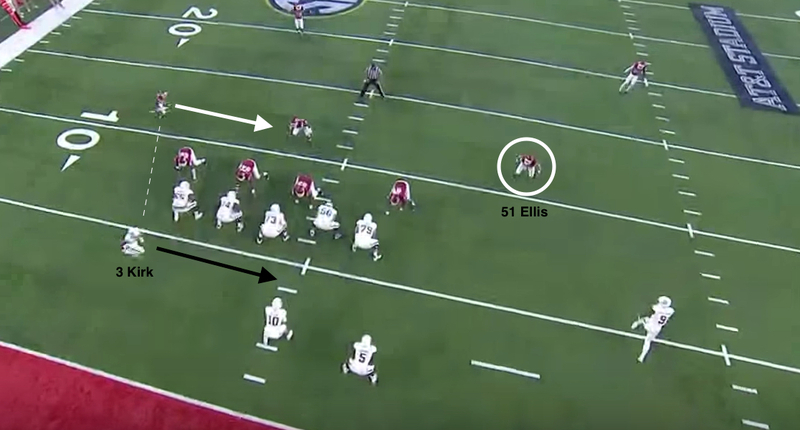 Because there were only five players on the LOS, the Aggies were forced to put two receivers on the LOS wide to the right. That made one receiver ineligible, but the Aggies didn’t plan on throwing the ball anyway. The next player to eye on this one is Arkansas OLB Ellis. He was really in a no-win situation. If he widened too far, Kirk would’ve cut up inside of him OR Allen would’ve checked to a run to Carson inside. But, in this case, he stayed tight to the box, which allowed Ricky Seals-Jones, aligned in the slot, to easily crack block Ellis and seal him inside. RB Tra Carson then read the block of RSJ and eyed one of the safeties. Had Ellis jumped hard outside, Carson would’ve led up inside and Kirk would’ve followed him. But, RSJ pinned Ellis inside, giving Carson an outside path up to the safety. The receivers are locked on blocks (in the circles). Carson had his sights on the safety. The only player that could possibly make this play was the cornerback that had followed Kirk across the formation. The problem for said DB was that he started two or three steps behind Kirk when the true freshman WR started in motion. Then, the DB actually blocked himself. He ran into Carson’s block on the Arkansas safety and pinned himself to the inside. But, the reality was that he wasn’t going to get there to make the tackle. Regardless, the roadblock Carson created certainly helped the cause. Kirk then hit the X button and sped through the gaping hole for a significant gain out of the shadow of his own end zone. I love this play design. LOVE it. But, when it’s designed to get a player like Kirk the ball in space, it’s that much better.